BURLINGTON, Vt. - The Vermont Catamounts opened the 2018-19 campaign with a 3-2 win over McGill in Saturday's exhibition at Gutterson Fieldhouse. Sammy Kolowrat's game-winning goal with 10:35 left in the third period lifted the Catamounts while Melissa Black, Blanka kodová, and Sierra Natzke combined for 20 saves. Lea Dumais and Kate Devries found the back of the net for McGill and Tricia Deguire stopped 25 shots. "It was good to get a win today, but more important to have a good learning experience," said head coach Jim Plumer. "I was really pleased with our new players and how well they blended with the returning players. We are hoping to be better next weekend against a strong UConn team." - The Martlets jumped out to a 1-0 lead on Devries' goal at 5:44 in the first period. - Saana Valkama tied the game with 1:58 left in the opening period on a feed from Anna Erickson. 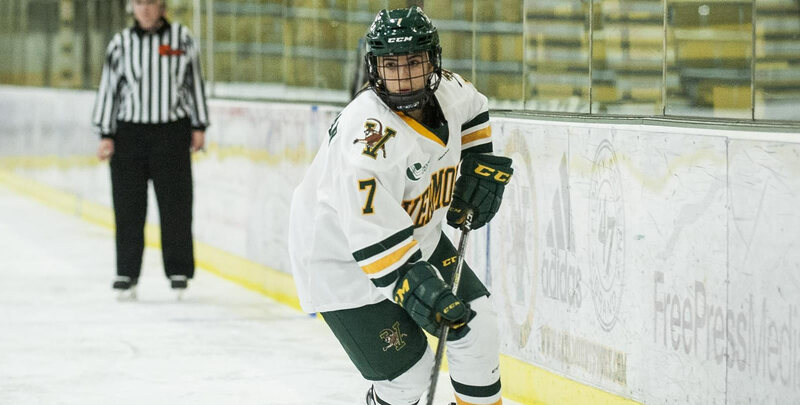 - Vermont took the lead in the second on its power play when Kristina Shanahan received a pass in the slot from Theresa Schafzahl and wristed a shot past Deguire with 15:52 left in the second period. Ève-Audrey Picard had the secondary assist. - After McGill tied the game at 2-2 early in the third period, Kolowrat fired a slap shot from the point that beat Deguire blocker side for the game-winning tally. The Catamounts begin the regular season Saturday (Oct. 6) when they host UConn for a Hockey East matchup. Puck drop is scheduled for 4 p.m.